For your information: the Sofia Service Desk is a brand of the International Hospitality and Facility Services Group. The Sofia Service Desk organises events and provides services to expats and companies in Sofia. Your information for the event. We try to give you good indications and information on what we expect from your presence and participation at the event. Also we inform you what is possible for you during this event. For questions, please contact us. If possible in English. Note: if you need more time for the preparation, no problem, please let us know in advance. Note: Artists are responsible for their own presentation, information and art works. Every artist is allowed to sell his/her work to guests that are interested. Active selling is not appreciated at this event. The Sofia Service Desk will not ask a commission from your sales. If you can make appointments with guests or companies we are very happy for you. If we can help, we will. Art is important for people, working people and offices. Art is a form of positive communication. But offices are big. Art can be expensive for big offices. For a company to buy art for the whole building is a big investment. The Sofia Service Desk makes you the following proposition. Your work can become part of our program Art Exchange. Art Exchange is an initiative of the Sofia Service Desk to make art work more accessible, get financial sponsoring for artists and make publicity and exposure for participating artists. 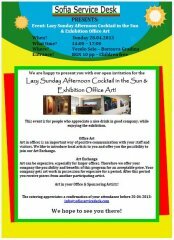 Companies enter the Art Exchange program and receive from us art work for their offices. Every change of the period companies receive new pieces from other participating artists. We ask you if you are interested to rent the 10 pieces of the exhibition to the Sofia Service Desk for the Art Exchange program. Possibly more pieces. Your work remains your property at all time. Your work will be at our disposal and care. We make sure nothing happens to your work. The rental period is open and can be terminated from either side. If you wish to change pieces during the rental period, this is possible every change. When the program is finished we will bring your work back to you. You will always know where your work is and we will see that you have access your work for visits only. If we can promote to sell your work, we will do that and we will notify you. Our goal with this proposition is to make art in offices available at a low entrance level. We wish to make (your) art and artist name more accessible to more people. We wish for you to make some money from this and we wish for companies to benefit from this form of positive communication with their staff and relations. More details of the program will be communicated to you if you are interested. Your benefit: Your work will be on constant display. With your work we will put name tags and information on how people can contact you. New business can emerge from this. Possibly a company wishes to keep your work and buy your work from you. This would be ideal. Please let us know if you are interested and if you can agree to our proposal. If you are interested but there are things you want to change, let us know and we can talk about this. There is still some place for more artists. If you have befriended artists, please forward them our details and we will contact them. The Art Exchange program is available for every participating artist. It would be wonderful to also have a sculptor at the exhibition, do you know somebody? Last question. We would like to know from all artists why they are interested in the Office Art Exhibition and what Office Art means to you. What is your reason for participation? We appreciate if you can send us links or pictures of your work. We hope to hear from you and receive your confirmation for the exhibition.